The ASRock G31M-S is an Intel G31 chipset based motherboard from ASROCK which offers easy overclocking and very good performance at an affordable price of $42.99 so it could be used in a good budget system. ASRock G31M-S supports all LGA775 processors including Penryn Quad Core Yorkfield and Dual Core Wolfdale processors. This motherboard have some unique features like ASRock OC Tuner, Intelligent Energy Saver, Instant Boot and Hybrid booster. With this motherboard you can easily overclock any LGA 775 processor. You can overclock CPUs with FSB800 MHz (e.g. E6000, E5000, E4000, E2000, E1200, E1000, Cel400 Series) to FSB1066 MHz in one second. Just short pin2 and pin3 for OC800 jumper, start your PC and voala - your FSB800 CPU is overclocked 33% above its nominal clock speed. You can overclock your CPU even further using the OC Tuner utility. I've managed to overclock Celeron430 1.8GHz CPU to 3.06GHz (FSB340 or 1360MHz effective) rock stable! Dude, it's 70% overclock! 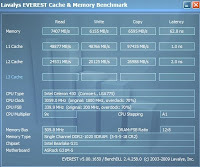 The ASRock G31M-S is indeed a hell of a board, and it did perform very well during testing. Paired with the Sapphire Radeon HD4650 512MB DDR3 PCI-Express graphic card I was able to play all new games at 1024x768, at max. quality settings with average frame rate of 30-50 frames per second. This board can support 8gb of memory ??? the Intel G31 boards have a limit 4gb ram, the support of this board is real ??? This motherboard supports up to 8GB of DDR2 800MHz memory. You can use two identical 4GB DDR2 memory modules on Asrock G31M-S motherboard without a problem. The only limitation of the Intel's G31 chipset is that you can use maximum 384MB of shared memory for the integrated graphic accelerator (if you are going to use the integrated Intel® Graphics Media Accelerator 3100 graphic subsystem). long life board isn't it ??? I bought a G31M-S board 2 days ago but until now I am having a problem installing the the embedded audio of the board there is always an error that says "we cannot find the HD audio" installation will now exit. what seems to be the problem? This is the specs of my pc: 1Gb Ram; 160Gb HDD SATA; Samsung DVD writer; integrated VGA. please help I use also the hotfix that said it should update first in the microsoft webiste but the same still happened. Enter your BIOS by pressing F2 on startup. Go to Advanced, and then Chipset configuration and set 'Onboard HD Audio' to 'Auto'. Save configuration changes and boot into Windows. 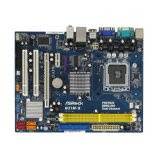 Download the latest ALC662 / VIA 1708S Audio Driver at http://www.asrock.com/mb/download.asp?Model=G31M-S&s=775 , install it and reboot when finished. What do you exactly mean by short pin2 and pin3 jumper, please explain. Should it be possible to overclock pentium dual core 1.6ghz to 3.0ghz with 667mhz memory? btw any difference between Asrock G31M-S and Asrock G31M-GS? You can use DDR2 memory modules operating at 667 MHz and you can overclock any Intel LGA775 processor operating at 800 MHz bus speed (e.g. E6000, E5000, E4000, E2000, E1200, E1000, Cel400 Series) to FSB1066 MHz by shorting pins 2 and 3 of the OC800 jumper on the ASRock G31M-S / G31M-GS motherboard. - Short pins 1 and 2 of the OC800 jumper. - Start your PC, hit F2, enter BIOS, click the 'Advanced' menu, then select 'Chipset configuration' and set the DRAM frequency to '[266MHz (DDRII533)]'. Save settings and exit Bios. - Shut down your PC and short pins 2 and 3 of the OC800 jumper. - Start your PC once again and everything should be OK.
As for the differences between Asrock G31M-S and Asrock G31M-GS motherboards, the only difference I can see is that ASRock G31M-S motherboard has built-in 10/100 LAN, and ASRock G31M-GS motherboard has Gigabit LAN. My problem i use the jumper oc 800 to 1066...everthing in bios on auto i don`t stop anithing...my Cpu boost to 3330 mhz ...everthing is oke in first day...i test with prime 95 12 hours...without an error...intel burn test 10 test on normal ...10 test on high no error PERFECT STABLE! and the temp ar maxim 45 * . Second day i test with intel burn test to make sure I`m stable...in test pc lost signal, computer even not post, remove components:ram, video ,etc i reset cmos and I put jumper on default 800 and everthing is working perfect normal.The question ,,With no signal and no bios post and the cpu working and no signal...I want to Oc e 5200 please help me ram on auto work at 667 mhz ...Defaut pc working perfect 2 years old...Many thanks and sorry for my horrible English!!! Press [F10] to save settings and try again. my frequency in bios is 667...My question is the prblem with no signal ``The Speed Spectrum`` or ``Intel Speed step`` can cause no pc Post??? Enter BIOS, navigate to 'Advanced menu' and change the 'Overclock Mode' option from 'Auto' to 'CPU, PCIE, Async.'. Also, make sure you short the correct pins of the OC jumper. You may disable the 'Intel SpeedStep' option, but I didn't have problems with this option enabled. You should leave the 'Speed Spectrum' option to 'AUTO'. PC Optimizer many thanks for the promptness and advice,I will try next week when I get home. My ram memory keep on deafault auto =667 or change on 800 mhz ??? My ram specification geil dual chanel 2x2Gb 800mhz. Review what should I do: Enter BIOS, navigate to "Advanced menu" and change the "Overclock Mode" option from 'Auto' to 'CPU, PCIE, async.I now to short the correct pins of the OC jumper...cpuz my fsb change 800 to 1066 and cpu frequenci 2500 mhz to 3330mhz.The computer worked perfectly stable one day Stable 12 hours on prime 95 and the intel burn test 10 pass normal and high, Second day give me the ,,No signal error`` during the Intel burn test, the only way to recover the computer was to reset the CMOS and put jumper to default=too scared :))I dont want to ruin the pc.Thanks for everything and sorry for my English and repetition.A good day and good health. You need to set the RAM frequency to 667MHz, do not leave it to 'AUTO'. You may set tRAS down to 15 later, however you should not notice any significant performance increase. E5200 2500 using oc jumper 3330 on default voltage .Is oke for daily use?? ?, i`m very happy PC Optimizer you are the greatest!!! Yes, your overclocking settings should be safe for daily use.